Since it is BBQ season, I wanted to make a homemade barbecue sauce. Most of the recipes I have seen call for ketchup. So I decided to start with that instead. For this ketchup I adapted a recipe from Nourishing Traditions . An ingredient in this recipe that may seem like an odd choice for ketchup: whey. Whey is a protein in milk and the by-product of making cheese; which I actually did! I had tons of whey left over. I think I filled up about 4-5 Tupperware. You can discard it, but there are many ways to use it and whey does have health benefits. By including whey in the ketchup, you increase lactobacilli. 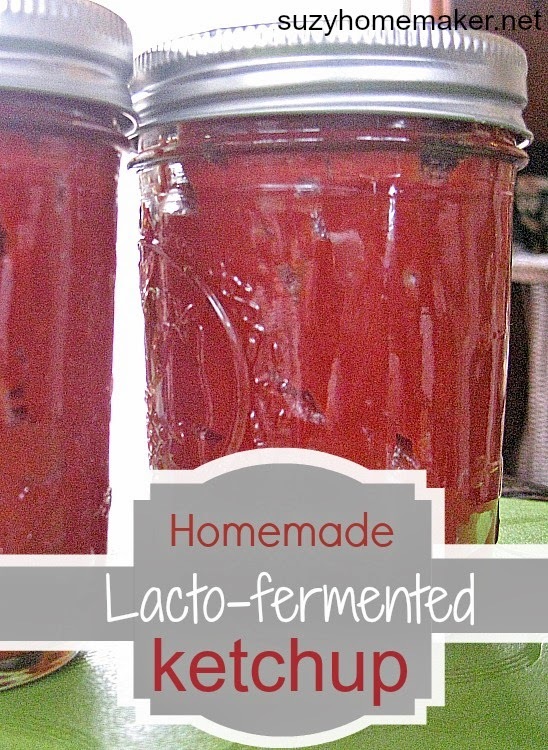 The proliferation of lactobacilli in fermented vegetables enhances their digestibility and increase vitamin levels. These beneficial organisms produce numerous helpful enzymes...promote the growth of healthy flora throughout the intestine. Think of all the yogurt commercials that talk about digestive health. This is why so many people are buying that yogurt. Place in wide-mouthed glass jar, leaving ~1 inch at the top. Leave on the counter in room temperature for two days and then move to fridge. The ketchup should last about 6 months in the fridge.